(Nanowerk News) A scientist at the U.S. Department of Energy's (DOE) Argonne National Laboratory has created visible-light catalysis, using silver chloride nanowires decorated with gold nanoparticles, that may decompose organic molecules in polluted water. "Silver nanowires have been extensively studied and used for a variety of applications, including transparent conductive electrodes for solar cells and optoelectronic devices," said nanoscientist Yugang Sun of Argonne's Center for Nanoscale Materials. "By chemically converting them into semiconducting silver chloride nanowires, followed by adding gold nanoparticles, we have created nanowires with a completely new set of properties that are significantly different from the original nanowires." 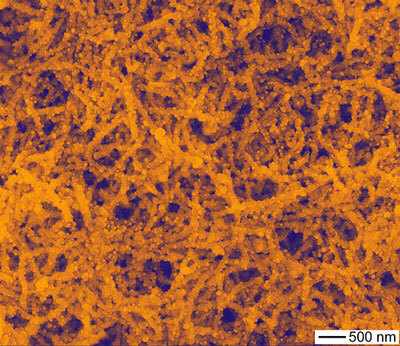 The gold-coated silver chloride nanowires at the microscopic level. Traditional silver chloride photocatalytic properties are restricted to ultraviolet and blue light wavelengths, but with the addition of the gold nanoparticles, they become photocatalytic in visible light. The visible light excites the electrons in the gold nanoparticles and initiates reactions that culminate in charge separation on the silver chloride nanowires. Tests have already shown that gold-decorated nanowires can decompose organic molecules such as methylene blue. "If you were to create a film of gold-decorated nanowires and allow polluted water to flow through it, the organic molecules may be destroyed with visible irradiation from conventional fluorescent light bulbs or the sun," Sun said. Sun started with traditional silver nanowires that were oxidized with iron chloride to create silver chloride nanowires. A sequential reaction with sodium tetrachloroaurate deposited the gold nanoparticles on the wires. Sun said it is possible to use a similar mechanism to deposit other metals such as palladium and platinum onto the silver chloride nanowires and create new properties, such as the ability to catalyze the splitting of water into hydrogen with sunlight. A paper on this research was published in the Journal of Physical Chemistry C ("Conversion of Ag Nanowires to AgCl Nanowires Decorated with Au Nanoparticles and Their Photocatalytic Activity").